LATEST ACCOMPLISHMENT: Winning a MacAdamy Award Special Citation for agreeing to cease & desist smuggling in (and showing) “Critical Mouse Halloween 1997” at every bicycle phlegm festival she attends. Sits right next to Bammy (Bay Area Music award) Honorable Mention issued in 2006 for the invention of “reverse busking” –playing extremely bad banjo until paid to take it elsewhere…. anywhere! Several awards elude Mme. Ozelle, but she’s leaving space on the mantel–just like her hero, Stephen Colbert. WHY I DO WHAT I DO: Because I can’t NOT do it. It’s actually a condition known as OCD (over-the-computer-dithering). I like to think my thoughtful mudvice as a public service. While never asked for, it is freely administered, with American-caliber Subtlety. The grateful recipients may then proceed through life conscious that There is Some Little Thing They Could be Doing Better If Only They Would Apply Themselves. Everybody wins:gratitude-stricken madvice recipient, Society in General, The Earth. FUTURE ACCOMPLISHMENTS: Three books that will simultaneously de-forest a fraction of Finland and propose Glow-ball Warming solutions, namely bicycling & walking rather than motoring about. 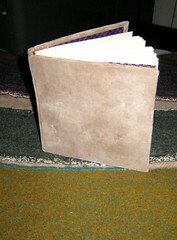 4″x4″ hardbound chapbook covered in recycled velvet, 82 pages, 30 illustrations. Second book: The Year Of The Wombat (365 Days To A Smoother You) Finally put down into words, the mystical secrets of the trail riding idiot savant. Guaranteed to unleash more non-athletic riders on trails and fire roads throughout the world. Third book: Fabulous Me, a 300-page tell-all me-moir. Now that the autobiography genre has run its course and become “so yesterday”, it’s finally interesting to Mme. Ozelle. Things must be (prematurely) rejected in order to be embraced by this brave do-goodress. it’s time to set the record straight with the true facts of my own trajectory through the wild and wooly (as well as denimy) world of fat tire history. Unique perspective (owning to xtra X chromosome) will be a sure-fire hit with the invisible 30 million riders who elude the comprehension of the oh-so-macho bicycle industry. ~ by jacquiephelan on November 11, 2007.